Many bright Kenyan scholars from poor backgrounds are unable to attend secondary school. 50% of Kenyan students drop out of formal education after primary school, and the statistics are even more alarming for girls. To cheap cialis 20mg combat this trend, Do Good Lab raised $4,000 for Akili Dada, a Kenyan organization that provides scholarships, mentoring, and leadership training to bright young women from disadvantaged backgrounds. Our gift paid for one Kenyan girl’s entire four-year secondary education at a top Kenyan school. With Kenya’s average per capita income at $786, the approximate $1,320 cost to fund a year’s tuition, fees, uniforms and books at a top quality high school is well beyond the reach of many families. As a result, many bright scholars from poor backgrounds are unable to attend secondary school. In fact, 50% of all Kenyan students drop out of formal education after primary school. The statistics are even more alarming for girls. While young women comprise a stunningly successful 48% of all primary school students, less than 30% of girls who complete primary school make it to secondary school, and of these even fewer complete their secondary school education. Poverty, early marriage, and the need for girls to contribute financially to maintaining households all lead to the disappointing discrepancies in girls access to education. Do Good Lab committed to raise $4,000, which is the cost of tuition for one scholar’s secondary education at a top ranked school for the entire four years. The scholarship includes tuition and fees as well as provides a moderate stipend for supplies and uniforms if needed. Please contact us via team@do-good-lab if you have questions about this project or Akili Dada. Akili Dada is an international nonprofit organization in Kenya dedicated to ensuring that the next generation of Kenya’s leaders includes women from diverse economic backgrounds. 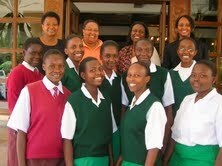 Visit their website for more on how they empower the next generation of African women leaders. Posted by Kathrin on Saturday, October 23rd, 2010 at 11:23 am.